One commercial and two residential projects recorded high sales during their recent launches. North Park Residences in Yishun Central sold 100 residential units during its public launch, in addition to the 313 the previous weekend during its soft launch, bumping its sum total sales to 413 condominium units. This equates to a little less than 70% of the 600 units released. On the other hand, price per square foot was quoted to be at an average of S$1,300. Thus, the selling price for the different units was somewhere from S$618,000 for a studio unit to S$1.89 million for a Vista Unit of five bedrooms. Demand for smaller condominium units was forecasted to be high, resulting into two-thirds of the condominium being composed of studio and two-bedroom units, with the TRIO dual-key units, an idea conceptualized by the developer Frasers Centrepoint Limited (FCL) during 2009, being the most popular. 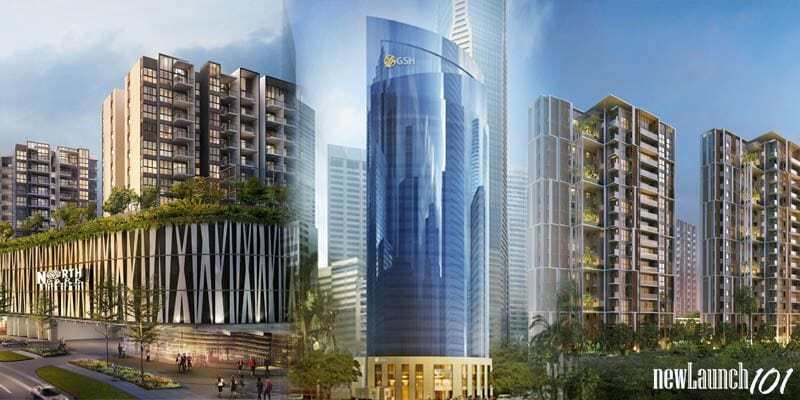 Expected to be finished by the year 2020, this 920-unit new launch condominium is being constructed above Northpoint City shopping mall in Yishun. Northpoint City is FCL’s 4th development, a sensational new project arranging out a planned 500 retail and F&B outlets, a Town Plaza, Yishun Integrated Transport Hub, and a community garden, in addition to the Nee Soon Central Community Club, said to be the first community club enclosed within a shopping mall. Elson Poo, who is FCL’s General Manager of sales and marketing, stated that the existence of medical facilities within the precinct allowed buyers to lease the properties for future stay giving them proximate access to medical attention during the years when they choose to retire. On the other hand, during its first phase sale, the GSH Plaza sold more than 60 out of the 100 units it doled out, giving a boost to the first quarter of 2015 for strata office sales. Buyers were given discounts, despite the fact that the quantum of the price cut was not mentioned. Nonetheless, the average price was cited to be somewhere between S$2,850 – $3,500 psf. Towering at 28-storeys and 259 strata office units, the GSH Plaza is located in the heart of the Central Business District of Singapore, is also home to two floors of retails space for 8 shops and 13 F&B joints. It is owned by Plaza Ventures Pte Ltd, a joint venture among GSH Corporation Ltd, TYJ Group, Vibrant Group LTD and DB2 Group. GSH’s Chief Executive Officer, Gilbert Ee, noted a big demand from individual buyers (local and foreign) as well as institutional buyers, who were interested in buying an entire level of strata office units. Lastly, Botanique at Bartley sold another 50 units during its second weekend of sales, adding up its sum total to more than 200. The units were sold at an average of S$1,290 psf. It offers 200 one-bedroom, 382 two-bedroom, and 215 three-bedroom units. The one-bedder, two bedder, and three bedder units measured at 495 – 689 sq ft, 657 – 958 sq ft, and 926 – 1,356 sq ft respectively. The two-bedroom units were the most popular among the purchasers. Owned by the UOL Group, this condominium contains a total of over 797 units in total and is located at the Upper Paya Lebar Road.